"Perseverance is a positive, active characteristic. It is not idly, passively waiting and hoping for some good thing to happen. It gives us hope by helping us realize that the righteous suffer no failure except in giving up and no longer trying. "We each have our own challenges and trials to overcome as we strive to keep on the right course. Often the most important trials are those we must face and subdue privately within our own hearts. 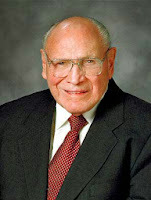 "I bear testimony that perseverance is essential to us in learning and living the principles of the gospel and that it will determine our progress as we strive to reach exaltation. Jesus is the Christ, the Son of God. He directs this Church. I am grateful to labor in his service and to be a special witness of his divinity." This was one of the early talks Elder Wirthlin gave after his call to the Quorum of Twelve. He encouraged members to "Never give up" in spite of obstacles, assuring us all the challenges would indeed be temporary. All encounter them; and all can survive if they keep their eye fixed on the eventual goal. 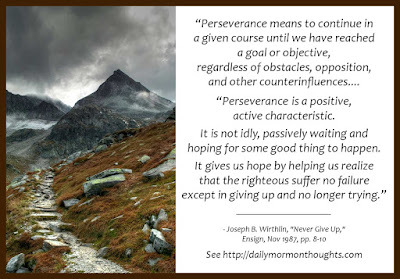 Elder Wirthlin's discussion of perseverance sounds very much like other discussions of "enduring to the end." It's a true principle, and we are blessed as we understand and implement this "positive, active characteristic." Labels: enduring, faithfulness, obstacles, perspective, trials, Wirthlin Joseph B.